Almost 35 years ago I won a college scholarship award given by the Fort Worth ISD in the Senior Portfolio Contest. Who knew back then as art students proudly wandered through the modern concourse of the Fort Worth National Bank Building what the future would hold for us, or for that space. We felt pretty special to have our portfolios, 10 Works in at least 3 mediums hanging in a space that looked a lot like a museum. It was fun to see everyone walking through the student works on display there. Not just our parents but customers of the bank and the businesses upstairs would take time to see what we had spent our entire senior year assembling. There was work from every grade on display but the main feature (for us anyway) was the Senior Portfolio Competition. It was a nice cash prize, maybe not enough to put much of a dent in my first semester at TCU, but the money was so definitely not the point. We were real artists now, with our work hanging on walls other than the art room and our living room at mom & dad’s house. Yes. In school I studied Finance, earning a BBA in exactly four years. I worked in restaurants, owned a small mortgage brokerage, then my own restaurants for 20+ years and finally got into real estate. I’m a broker now with my own firm, Fort Worth Texas Real Estate. 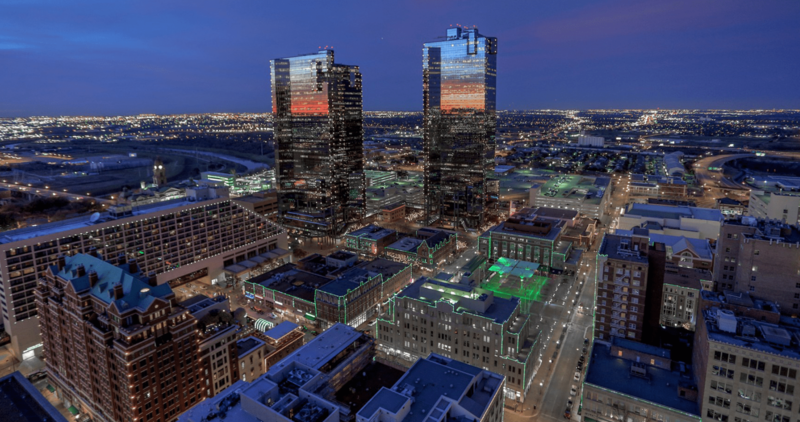 As a resident of the newly revitalized downtown I have acquired a special expertise in helping people explore the idea of giving up the yard, the lawn-mower and the rest of suburban Texas to move to a high-rise condo in our stunning city center. Life in Fort Worth Texas is just a series of concentric and overlapping circles to me. Everything in this crazy town will come back to a point of beginning in some of the most amazing ways. So many of my friends today who were in that group of Senior artists with me have gone on to do fantastic things with their artistic abilities where I did not. They are directors at the local community museum, artists, designers, film-makers, etc. And me…. I’m a Realtor. One day this week I took a day off from selling houses and condos and answered the call to join a group called Urban Sketchers Texas. When I say join, I don’t mean sign up and pay a fee. I just joined them. Outside of Razoo’s at 2:30pm with our sketch pads in hand. We split up and drew whatever we found of interest downtown (whole other subject) and then met back at Razoo’s where we got a table and had a bite to eat and a beverage to compare our works. 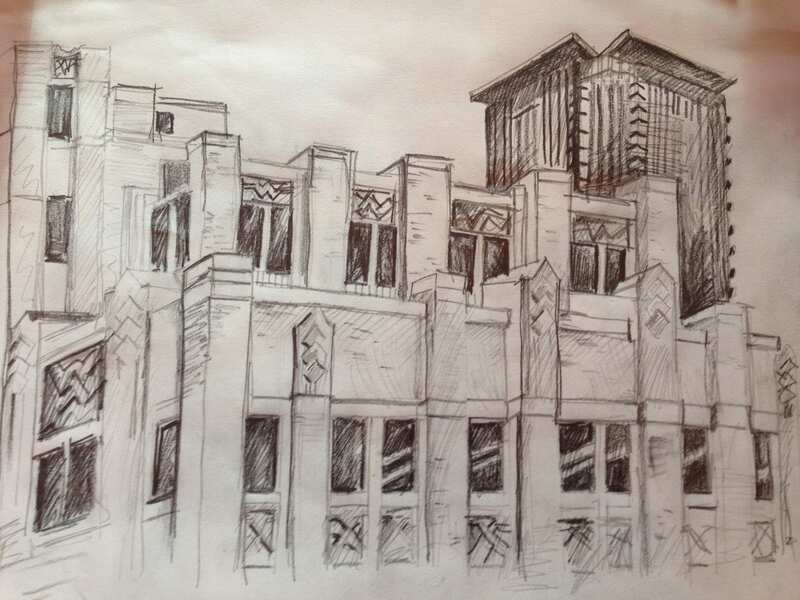 From the table at Razoo’s I could gaze out the window, across the new Westbrook building (which was the subject of my drawing) to The Tower Residential Condos at 500 Throckmorton Street. The full circle in this story is this. That tall green glass building on the edge of Fort Worths burgeoning and exciting Sundance Square is the same building that was decimated by the tornado of 2000. After The Fort Worth National Bank Building took that fierce and direct hit it remained abandoned and boarded up for several years. Eventually the iconic tower was redeveloped as some of the first residential condos in downtown Fort Worth. I sold 3 homes in The Tower Residential Condos this year. Each time I walk through the lobby I can’t forget the student art show. Although the lobby has been reconfigured the slanted concrete beams are still prominent architectural elements and I remember when my paintings and drawings were on display there. The Alexander Calder sculpture “The Eagle” no longer sits out front either. Those things are just a part of local and personal history and my memory. The picture that I sketched today, one of the first artistic attempts I have made in decades has a blended contrast of old and new Fort Worth. It’s a great source of joy to me to be in this picture and a part of it.